20 & 40.5" cylinders, 34" stroke, 400 hp @ 80 rpm engine from Fairgrieve Brothers, Hamilton originally in propeller CANADA (1872); rebuilt 1892. 11'3" by 10'3" 170 # steam scotch boiler. 1892 Built for service between Duluth, MN & Montreal, QUE; largest vessel in the trade. 1892, Nov 3 Maiden voyage. 1892, Oct Collision with schooner MINNEDOSA, Welland Canal. 1902, Jun 27 Owned John Balmer Fairgrieve, Hamilton, ONT. 1902 Owned Frank Balmer, Toronto, ONT. 1914, Apr 22 Owned J.W. Norcross, Toronto, ONT. 1915, Jan 13 Owned Lake Commerce Lines Ldt., Toronto, ONT. 1915, Oct 29 Owned Canadian Northwest Steamship Co., Toronto, ONT. 1917, Apr 13 Owned Montreal Transportation Co.
1921, Nov 28 Owned Canada Steamship Lines Ltd., Montreal. 1926, May 28 Owned Gulf Iron Works, St. Lawrence Stevedoring Co., Quebec. 1926, Jun 1 Owned Canadian Import Co., Quebec. 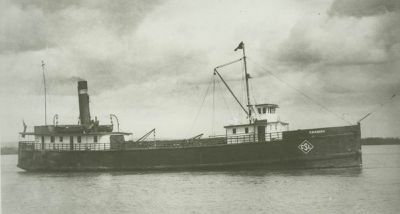 1935 Rebuilt as barge, 595 gross tons. 1935, May 17 Laid up Quebec.